A good fly rod is the make-it-or-break-it when it comes to fishing equipment. Especially when it comes to fly fishing because of the constant casting you do. Although fly fishing rods can range up above a thousand dollars, it is most definitely not necessary to spend that much to get a good fly rod. The trick is to find a rod that fits your style, target fish species, and conditions. Understanding things such as the pieces you need, rod action, weight, and more will help you choose the best fly rod under 200 dollars for your needs. This list was created to help you go out and find the best fly rod under 200. More specifically, this list shows rods from 5-6 weight, one of the more common sizes. 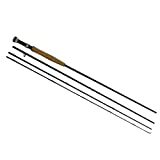 Other sizes of the same rod are available as well. It always helps to start with a visual comparison of the options. Here are the top candidates for the best fly rod under 200 dollars, and some of their features. Get the best fly fishing combo of 2019! Designed by one the best fly fisherman of all time, Lefty Kreh, the Professional Series II is a work of art. If you haven’t heard of Lefty, look him up to see why he is one the most renowned and respected fly fisherman ever. From the reviews and this rods performance, this rod hasn’t tarnished his reputation. This series is available in 4 pieces and a medium fast action, and is made of IM6 graphite. The grip is made of cork. The rod also has alignment dots on it to help ensure each piece fits together the same every time. This is a very forgiving rod, making it an excellent starter rod, but I don’t think an expert would be disappointed either. Many reports say it is comparable to rods far more expensive. The medium fast action is a great compromise and should work well with many fish species and fishing styles. This rod doesn’t come with a tube, so that is something you will want to purchase if you want it to last. The warranty on this rod is great coming from Temple Fork Outfitters – a Lifetime No Fault warranty, where basically if the rod ever breaks, you send it in with 30 bucks and they repair it regardless of the damage, sometimes sending a new rod. Temple Fork has hit another home run with the Professional Series II fly rod. Find out more information in this great review video. One of the nation’s biggest rod makers, Fenwick has released another quality rod in the Aetos Fly Rod. The 8’6″ version is considered a 5 weight, and comes in 4 pieces. This series is a fast action, meaning the rod might feel a little stiffer as it bends further up the tip than a more moderate rod. It comes with a comfortable cork grip. This lineup from Fenwick is highly rated by those who have had the pleasure of using them. The Fenwick Aetos is made from anodized Aluminium, and as a result will be great for years to come. The Aetos has raving fans everywhere, with many people saying it is also comparable to many much more expensive rods they have fished with. 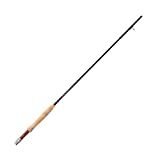 This rod would be a solid rod for an intermediate fisherman due to it’s action and performance. It is backed by Fenwick’s Limited Lifetime Warranty, where if it breaks from a manufacturers defect, they will replace it free of charge. If you break it accidentally, let them know what happened and send the rod in and they will give you a steeply discounted price as a replacement. The Redington Classic Trout Fly Rod is exactly what it’s name says – a classic trout fly fishing rod. This isn’t a bad thing, though, as it just refers to the style it is made for, which is stream casting. That’s why this comes in a moderate action and is very forgiving. This specific model is 9′ and 4 pieces and is rated as a 6 weight. You can also purchase these in a six piece if you are doing any traveling. This rod is ideal for beginners due to the action it comes with, which will be very forgiving. It may lack a little backbone for roll casting or other power casting techniques, but the moderate action is wonderful for stream fishing. Reviewers say this rod makes a great addition to their collection as it has it’s ideal conditions. If you are a beginner and looking to get into trout fishing, this may be the rod for you. It’s also backed by Redington’s lifetime warranty for added peace of mind. To help protect this rod, they will send you a hard tube with it as well for storage and traveling. Another Lefty Kreh designed rod, the Signature series is another quality rod on a budget from Temple Fork Outfitters. It’s actually a two piece rod – the picture shows two separate rods that are two pieces each. The 6 weight specifically is 9 feet long. With a 2 piece rod, each section will be 4 and a half feet long, so just make sure you have the space to transport this and store it safely. Two pieces may appeal to many because of quickness of setting up as well as performance. The action of this series is medium fast, a great compromise to make this a great rod for just about anybody. If you are looking for a starter rod at an outstanding price AND a lifetime warranty, which is unbelievable on such a cheap rod – send in 30 dollars and the broken rod to them and they will repair or replace it. Lefty Kreh says, “Not too long ago this incredibly smooth two-piece rod would have cost several times as much,” and it’s absolutely true. Fly rods come at many different prices, and I would recommend spending a minimum of 99 dollars on the Allen Compass. As they start getting cheaper than that, quality is really compromised, and for under 200 dollars, you can get a fly rod that will outperform many more expensive ones. If you select one of the rods on this list, you will be getting the best fly rod under 200 dollars that can last for years. All of these rods will deliver the performance you are looking for at a great price. Good luck selecting yours.